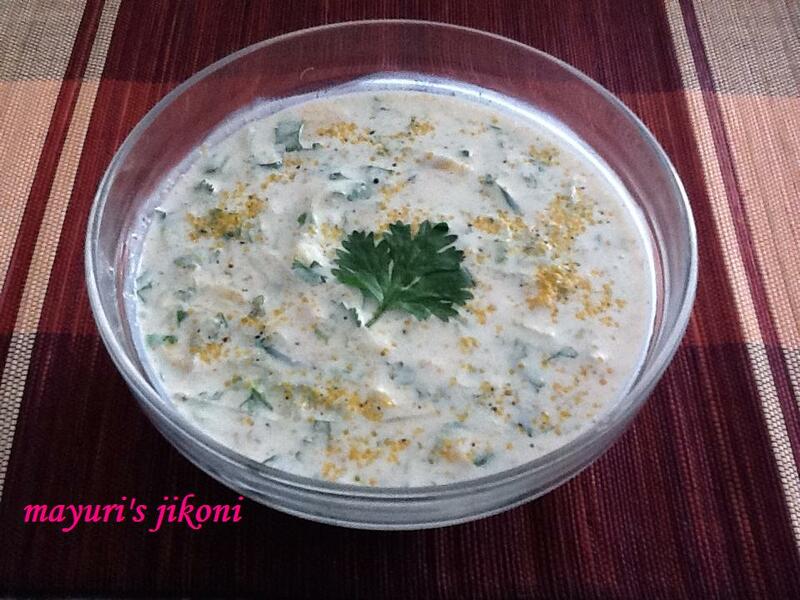 Raita is a yogurt based dish which is usually served as an accompaniment to a main dish. Raita can be made using many vegetables like cucumber, radish, fruits like banana, pomegranate, grapes and savoury bundi. I made this traditional raita after such a long time. I say traditional because that’s the raita my mum use to make and when I got married, Nunu use to make it. Raita is a very cooling dish to have with parathas, on its own or with a full indian meal. My grandfather always use to say, ‘there should be enough mustard powder in the raita so that when we eat it, the mustard should be able to tickle our nose’. What he really meant was that it should be loaded with mustard powder. I don’t make it so pungent as I would like to taste the other ingredients too. If the peel of the cucumber is tender, grate it with the peel. Squeeze out the water from it. Put into a bowl. Peel and chop the bananas either into thin slices or diced and add to the cucumber. Leave it in the fridge till you need to serve it. For cumin powder, roast some cumin seeds over low flame in a pan. Let it cool and then grind. Can add grapes, pomegranate, sweet pineapple, strawberries, other berries if you like. Mustard powder is readily available in most indian shops. If not you can use 1 tsp mustard paste instead. A good salad substitute to have when you have a BBQ party. Use greek yogurt if available.